This auto is a 1918 Paige Model 6-55 Larchmont four-passenger sport roadster, built by the Paige-Detroit Motor Car Company. It has a 300 cubic inch, six cylinder Continental engine (#10D76920, dated 4-11-18). The low compression engine produces about 30 horsepower. It cruises at about 30 mph. The builder's plate on the frame shows chassis 76986 and motor 76920. It's a heavy car that is stopped by mechanical brakes on the rear wheels. For competition purposes it's in Antique Automobile Club of America Class 16 (gas vehicles, more than 4 cylinders, 1913-1919). It's an attractive car, but the finish is not accurate. The body should be dark blue, not yellow and dark green. The upholstery should be green-blue leather, not brown Naugahyde. The top frame came from a different car and is not the right shape. The brass radiator and brass trim should be painted either dark blue or black. The rear of the body slants forward to give it a unique profile. There is a cowl behind the front seat that houses mahogany compartments and a push-button light. During this period the Paige had a distinctive v-shaped radiator. In 1918 the body followed what were called "military lines," meaning a hood that is high and a body that is low, which was a departure from designs of previous years. There is a lot of empty space under that high hood! Its slanting, one-piece windshield was also considered noteworthy. The top was described as a one-man top, but this feature wasn't new or unique to Paige. The tires are 34 x 5 on 24" diameter wooden spoke wheels, inflated to 70 pounds air pressure, on split-rims. Steel wheels or wire wheels were options. It has no ignition lock. Instead, it has a Yale lock at the base of the shift lever that locks the transmission in neutral. To repair punctures on the road it has an air pump that engages the engine flywheel. 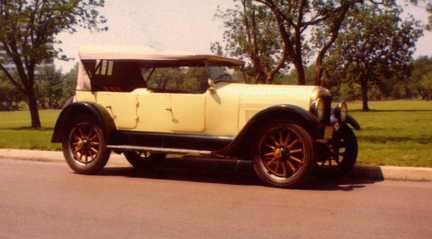 Among the novelties in motor driven vehicles the show period of 1918 reveals are two new models that are being added to the Paige line of automobiles. . . The two new models added to the unusually complete Paige line, and which are shown to the public for the first time at the New York show, are the "Six-39" Cabriolet and the "Six-53" [sic] Sport Roadster. . . Distinction and originality were especially sought in designing the new Sport Roadster. Low lines and the modified width of the body, coupled with a somewhat high and powerful looking hood, give the car a raciness that will doubtless appeal to many. The body would usually be termed a four-passenger, but in a pinch a fifth person could ride in comfort. The windshield is a new style, carrying but one piece of glass. The top being low and narrow conforms to the racy character of the general design. The Sport Roadster is finish in a new shade - Rols [sic] Royce Blue. The upholstery is in green-blue pencil-grain leather. A nickled metal moulding [sic] is used to edge the upholstering. . .